Unearthed is, before anything else, a monolith. It's a whopping five CDs of material, four of which are previously unreleased. The first three are outtakes from the four American Recordings albums Johnny Cash recorded with producer Rick Rubin. Disc four is an entirely new album of gospel songs Cash recorded from his mother's hymnal around the time of American III: Solitary Man. The final disc is a compilation drawn from the released albums. It was planned as a tenth anniversary celebration of the Cash and Rubin collaboration that began in 1992, while they were working on a fifth album. It is, effectively, the last will and testament from country music's grandest and most towering and enduring figure, Hank Williams not withstanding. The box was finished and the final mixes were sent to Cash, though he died before they arrived. 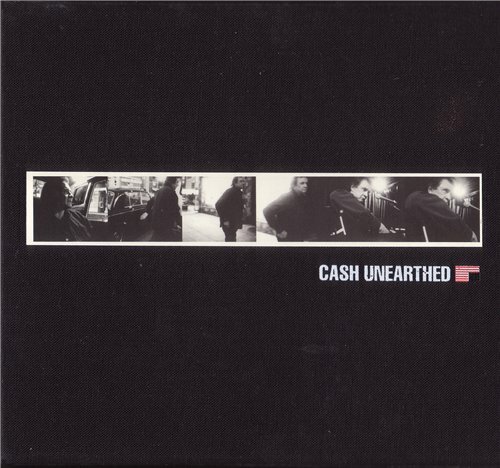 During Cash's tenure with American Recordings that began in 1992, he and Rubin would cut anywhere between 40 and 80 songs for each record; for the first one they recorded over 100. Disc one, entitled "Who's Gonna Cry," features Cash singing unaccompanied as he did on American Recordings, his debut for the label. Discs two and three -- entitled "Trouble in Mind" and "Redemption Songs," respectively -- come from the material recorded for the other three and are collaborations with singers such as Nick Cave, Glen Campbell, Fiona Apple, Tom Petty, Joe Strummer, and Carl Perkins, as well as other musicians who include Norman Blake, the Heartbreakers, the rhythm section for the Red Hot Chili Peppers, Smokey Hormel, the Red Devils, John Carter Cash, as well as Laura and Rosanne and Cowboy Jack Clement. There are also alternate takes of some material used on the recordings with different accompaniment, including a voice and acoustic guitar read of "When the Man Comes Around." Between-track banter is abundant, as is the humor. While the majority of this material is terrific, and arguably some of it could have been used interchangeably with what was released, there are tracks that were experiments that don't quite measure up, though they remain examples of the Man in Black at his most inspired. The reading of "He Stopped Loving Her Today" is a case in point. It is a classic country song that was defined by George Jones. Cash's reading, though honest, taught, and fierce, lacks the pathos and harrowing depth of the Jones version. Likewise, the duet with Fiona Apple on Cat Stevens' "Father and Son" just out and out falters. "Gentle on My Mind," with Glen Campbell, is obviously fraught with genuine admiration on the part of both singers, but it's obvious that the definitive version had already been done and this one misses. Likewise, some of the material from Solitary Man and Unchained is well-intentioned and passionately wrought, but it is obvious why these songs didn't make the cut. But there are genuine revelations, too, such as the solo acoustic treatment of "Long Black Veil." It leaves its previous 1966 incarnation in the dust. On this one, the song is from the heart of the lonesome, love-torn ghost, looking upon the woman who wanders the graveyard and weeps at his headstone. To say it is chilling is one thing; the fact that it opens the entire collection is nearly devastating. Cash's covers of Billy Joe Shaver's "I'm Just an Old Chunk of Coal" and Jimmy Webb's "Wichita Lineman" define the term Americana, and add great depth and dimension to the original versions. While a solo version of Bob Marley's "Redemption Song" was issued on Joe Strummer's posthumous Streetcore, it is this duet with Cash that is the most moving and clear -- and Cash refused to change the Jamaican patois in Marley's language. Likewise, the two versions of Dolly Parton's "I'm a Drifter" are both visionary, as is a sage read of Neil Young's "Pocahontas" and the shattering take of Stephen Foster's "Hard Times (Come Again No More)." Cash's retelling of Steve Earle's "Devil's Right Hand" gives the song an entirely different meaning. On the canonical material, evidenced by "Trouble in Mind," "Salty Dog," Jean Ritchie's "The L & N Don't Stop Here Anymore," Marty Robbins' "Big Iron," Rodgers & Hammerstein's "You'll Never Walk Alone," and Jimmie Davis' "You Are My Sunshine," Cash sings with the authority of a singer who has inherited the legacy tradition he carries in the grain of his voice. But it is the fourth disc, consisting of old country gospel songs, that steals the entire show here. Most of these songs Cash carried with him most of his life. Many come from a battered and tattered book of his mother's; Cash offers a completely unadorned devotional reading of spirituals from the annals of his Southern gothic gospel experience. While some of these are closely associated with the African-American gospel tradition of Thomas Dorsey, Cash points out in the liner notes that these songs existed simultaneously in the white church. In these 14 songs, from the rounds of "I'll Fly Away" and "Do Lord" to the expansive "Where the Soul of a Man Never Dies" and "In the Sweet By and By" to the modern gospel classic "I Am a Pilgrim" by Merle Travis, Cash's conviction and complexity are everywhere evident. These are simple songs with complex emotions, and in his readings of them they carry the paradoxes of his life, from drug addiction to grace to social justice stances to reverence, humility, and the willingness to live the gospel. They are towering because of their vulnerability and their need to communicate directly -- with searing yet human intensity -- the revelation of the singer's held truth. Unearthed is a true best-of set: a collection of the finest tracks from the remarkable symbiotic collaboration between Cash and Rubin. The five CDs are accompanied by a stellar package that includes a 100-page booklet with brilliant and deeply moving liner notes by Sylvie Simmons. Her written portraiture of Cash in his wheelchair talking about the music here and his future plans is realistic, humble, and respectfully empathetic. In addition, each track on the set is annotated in the book by directly attributed quotes she gathered from Cash, and also from Rubin and the many principals involved in the sessions. One hopes that this is the last box of the recordings from American, because it is so fine, so brilliantly woven, and so soulfully presented with an ear to quality and vision that anything other than the assemblage of American V from the recordings already completed would seem superfluous, blunting the impact of this grand and necessary document. Here is the depth of the vision and commitment of Johnny Cash to song, presented elegantly and magnificently, a mirror image of the man and his myth. Any chance of reposting this as a separate archive for each album, rather than a single archive of the whole box set?